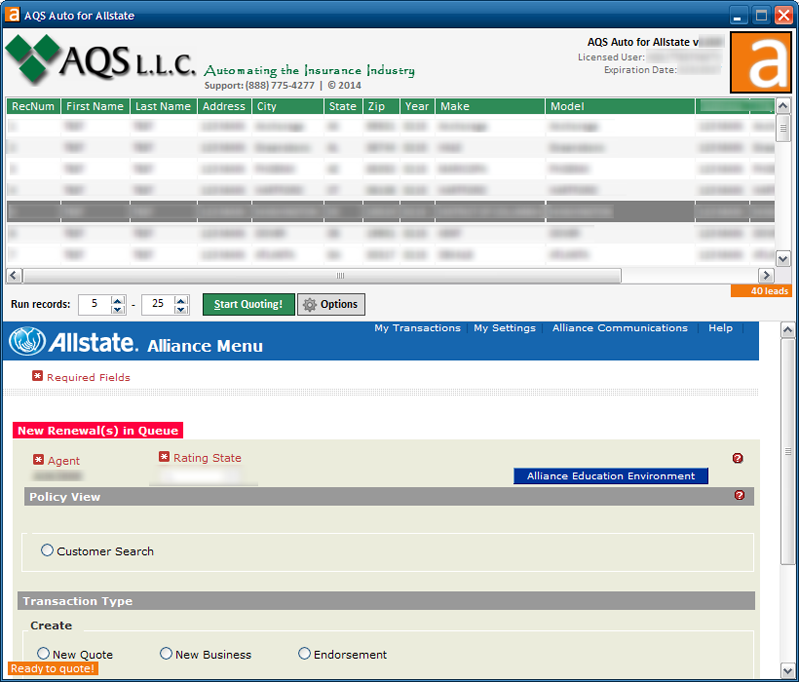 AQS Auto for Allstate software is provided to you as a yearly license. The software can be installed on multiple computers and can be used by anyone at your agency, simply and effectively. AQS provides FREE tech support and FREE software updates for the term of your license. Installation is worry-free as our programmers will remote in, install the software and walk you through your settings by running a sample quote. We do the set-up for you! You are in complete control of your end quotes and can modify your settings at anytime. Log in, load your leads, select the records you would like to run, QUOTE. It's that easy! AQS Auto leads are exclusive to your agency! Our leads are provided to you by zip code, which you can target or run on a radius. Auto leads are a one-time purchase and can be acquired at anytime. The minimum order is 2000 leads. A bulk discount is available! Each auto lead will contain: name, address, year, make and model of a single vehicle. Phone numbers can be appended upon request for an additional fee. Our data is accurate and sourced from self-submitted information (i.e. : a prospect has their oil changed, car serviced or purchases an extended warranty). All data is NCOA-scrubbed and CASS-certified to ensure deliverability and to qualify your mailings for bulk rate. It is the agent's responsibility to follow Allstate's scrubbing and DNC guidelines. Copyright © 2018 - All Rights Reserved - AQS L.L.C.